You are here:Home » Luxury Indulgence » Vanilla Pod - Good Food, Great People! Housed in an orchid garden at Mandai Lake Road, away from the bustling city, is Vanilla Pod, offering fine Continental cuisine. I was there with my childhood friend SJ, for lunch today. I was surprised when he suggested the place as it was nestled in a lushly forested quiet area. I thought only those residing nearby would be familiar with Vanilla Pod. My immediate response was, “Oh, yes, I’d love to. The food is good there & my deepest impression was the Foie Gras”. 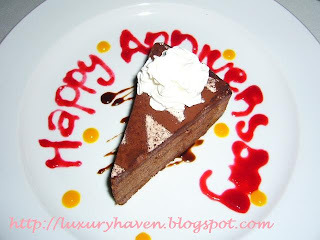 I’ve been to Vanilla Pod on few occasions but the most memorable was a dinner with my family on our wedding anniversary. The cake above was complimentary from the restaurant during our last visit. As it was a last minute decision today, I was caught off-guard. I was in my jeans & without my camera. So sorry folks, no mouth-watering pix for you to drool over the food. I wouldn’t have written this post if not for the kind gesture of the maître d', who has served the entire lunch with her smile, tact & professionalism. For starters, we’d Canadian Oysters on the Rocks, Portobello Mushroom & needless to say, my fave Pan-Seared Duck Liver, which was served with caramelised figs laced with vincotto reduction sauce. The oysters were really plumpy & fresh & at S$4.50 a piece, it’s really a steal. SJ & I both found the Portobello Mushroom done differently this time. It was coated with breadcrumbs, probably mixed with some parmesan cheese. It was a little too heavy, which had disguised the natural taste of the “Champignon de Paris”. I kinda prefer the old way of doing it, grilled without the crumbs. The Foie Gras was as expected, one of the best I’ve ever tasted. Crispy on the outside & juicy on the inside, the pan-seared liver melts in your mouth, sending you immediately to another dimension. Although SJ & I both considered the piece of Foie Gras a little too small, we kept it to ourselves. Who would have thought the meagre size caught the eye of the server, who actually took the trouble to feedback to the Chef. We were surprised when she later brought another plate of this delicacy, explaining it was a compliment from the Chef, due to the shortfall. Boy, I really was impressed by her attention to details! SJ ordered the Green Pea Soup while I stuck to my usual Mushroom Soup. I’m always satisfied with their Chunky Mushroom Soup, with bits & pieces of few different types of mushroom. Adding zest to this soup, was a touch of what I thought to be truffle oil. Gosh, I just love the richness of this soup & who cares what SJ’s soup tastes like!! For the Spaghetti Vongole & Tiramisu, there was nothing to shout about. They were very ordinary, somehow lacking some punch. But the Molton Chocolate tells a different story. Eating together with the vanilla ice-cream, each mouthful revealed pleasurable explosions of the warm & creamy chocolate oozing out from the cake. Excellent companion, impeccable service, flowers setting the scene for a fantastic gourmet dining experience with views overlooking the orchid garden, what else could I ask for? Thank you SJ, for the lovely meal & thank you, Vanilla Pod, for the wholesome epicurean. I should’ve gotten the name of the lady……… Rating: 4/5. I've been there with my family once when we went to Mandai zoo. Yah, food is nice & I like the crab cakes. It's great that you took the effort to write this post to compliment the waitress. Your writing makes me wanna revisit even without pictures. Cheers! Great post! Surely the waitress is worth complimenting - giving the necessary attention when needed while not diturbing your meal. But why no pictures? Now i cannot even salivate over the food without the picures, LOL. Just kidding, surely you have given enough description on the food and making everyone wanting to try it out. Babel & Deli simplicity, thks for your lovely comments & kudos to Sherlyn (finally got her name) & Vanilla Pod for their great service & food! Thank you for visiting! Love your blog, cool one! I found you on FBz and sent u a request. Looking foward to sharing with you.. It's always wonderful experience eating in a place where there's good food and good service. Yes, a little disappointed you forgot your camera to snap all the lovely food. Next time, PLEASE remember, ok? Simply Life, keep this place on your list if u do visit S'pore! Mary, will try to keep my camera by my side from now. LOL!